Nothing more honest than a simple little truck. Summer 2014: My wife and I are driving down a main road in town in my dad’s fire-engine red 1993 Dodge 250. The 8-ft bed is empty as we’re coming back from one of countless trips to the recycling center. We’ve been clearing what seems like acres of brush from our back yard (it’s much more reasonably measured in square feet, but hey, it was plenty of work anyway) and the loaned pickup truck is putting in WORK. 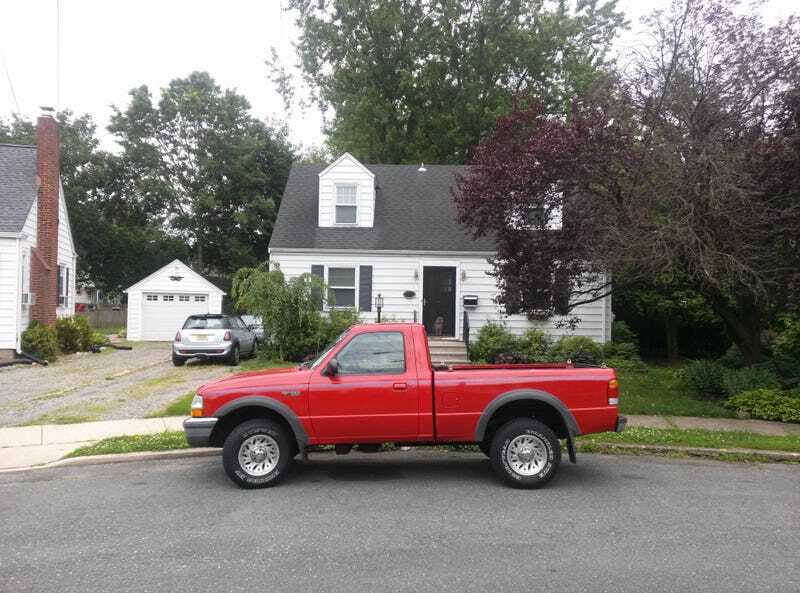 As we pass a car dealership, we each see a small pickup on display at the front of the lot, and my wife says, “You know, we borrow this truck so often, why don’t we just buy one of our own?” Before she can take back those words, I pull into the parking lot and we each step onto the pavement, ratty jeans and dirt-smudged T-shirts and everything. We test drive two Rangers that day; one an ‘88 that is rusty, crusty, sloppy and rough, which I begrudgingly pass on, and the other an automatic ‘98 with the 4.0 V6. This one feels good to drive, the 4x4 works, the interior is clean... So we talk price, settle on $2995 out-the-door, and swipe our credit card. And, just like that, we were truck people. I owned the Ranger for a little over 2 years. I learned plenty about all the “quirks” of the little beater. The throttle body was sticky - it would periodically decide to idle around 3,000 rpms until I introduced some WD-40 to the 18-year-old hinge. The valve cover gaskets seeped, and after every trip you would be greeted by the smell of warm oil. The frame and underbody, despite being straight, were so rusty that I became convinced that the previous owner routinely dunked it in saltwater. The transmission, when it was cold, would pop out of gear at low speeds occasionally. The combination of engine, transmission, and gearing made it dog-slow even when it was new, let alone after 180,000 miles. Oh, and the anti-theft alarm would shriek like a banshee whenever you unlocked it. So I just never bothered locking it. And none of that really mattered. We all own cars for different reasons, and this one had its purpose. It was to be used to cart heavy, obnoxious loads from one place to another, serve as a backup vehicle when one of our other cars was incapacitated, and cost as little as humanly possible to own and operate. The plan was to keep the truck until the first big-ticket part went, and then send it to the scrapyard and start looking for the next one. One of the many projects we tackled which a reasonable person would hire someone for. No one has ever called me a reasonable person. Summer 2015: We pull around the back of the landscaping supplier for the third time in two days. A front-end loader is idling next to one of the gravel piles, and as we settle in next to him, the operator gives us a thumbs-up and scoops a big gouge out of the pile. He positions the bucket above the Ranger’s bed and, as gently as he can, pours the 1,000 lb load into the back of the truck. It’s an interesting sensation, looking out the back window at a pile of gravel building up 2 feet away from you, as the suspension settles to accommodate the weight. When he finishes, he pulls the loader next to the driver’s-side window and shouts over the diesel rumble, “I overestimated a bit... it’s probably closer to 3/4 of a ton than 1/2... It’s on the house, have a good one!” I turn to my wife with a slight look of horror as I do some mental math. Hmmm, I think it’s a 1,200 lb payload capacity... deduct for 18 years of abuse, 180,000 miles, and more iron-oxide on the leaf springs than steel at this point... What are the odds this thing makes it home without collapsing? But we made it home. Without even a hiccup. And again for a second trip 2 hours later. And again for a third. 15 bucks worth of gravel really weighs a lot, but the Ranger could take it. It hauled a bunch of stuff and saved us hundreds on delivery and pick-up charges for the random projects around the house and yard I somehow talk my wife into. That giant bush on the left-hand side probably took 8 hours of work to get out. The truck didn’t help with that. Part of what appealed to me about the Ranger is that it didn’t ask for anything from me. Well, maybe it asked, but it didn’t demand anything. Want to know the maintenance I did on it in 2-1/2 years? Don’t worry; it’s a short list. I replaced the fuel filter - that was $20 and took 15 minutes. I cleaned the idle air valve - that was 2 bolts and a shot of compressed air through the filter. And I sent it to the mechanic once, where he replaced the idle air valve, fixed an evaporative leak at the gas tank, added some oil, and managed to get it to pass inspection. That was a whopper of a maintenance bill at $375. Normally, when I buy a new car, I make a custom maintenance and mileage notebook that lives in the glovebox so I can keep track of the car’s history, but with the Ranger it just seemed like... well, what was the point? I never even changed the oil. I feel kind of guilty about that, like I was neglecting a puppy or something, but, to be honest, I didn’t expect the rest of the truck to last that long. Yes, I know that oil’s lubricative properties degrade over time, not just with use, and yes, I know that piston rings and other components are more prone to failure with old oil, but over the course of 2-1/2 years of ownership, I didn’t even put 5,000 miles on it. If anything, I expected the transmission to drop out or the rear suspension to collapse catastrophically before some old oil could cause the engine to blow up. Fall 2015: I’m driving down a windy backroad in the Delaware River Valley on my way to work and I start to hear a faint rattling sound coming from the bed. Having just moved a few loads of river stone over the weekend, I suspect one of them stowed away under the bedliner and is now bouncing around between the bed and tailgate. I finish my journey and head into work. At lunchtime a co-worker comes over to my desk and informs me that my muffler is hanging off. Turns out the exhaust had rusted out behind the cat, and the rattling sound this morning was actually this thing scraping a 10-mile long groove in the tarmac as it flopped around. With the sparks it must have been throwing I probably looked like the FoxTrax Glow Puck. So I jiggled the last stalwart exhaust hanger free of its bracket, using some engine oil as a lubricant, and chucked the 5' length of muffler and tailpipe into the bed, and drove that truck around without a muffler for the next year. It was obnoxiously loud, but I felt it was a fitting “modification” that espoused the purpose and character of that Ranger. Also, I was too cheap to replace it. All told, I spent $3,500 on the purchase and maintenance of the truck. Here are a few things that we used the Ranger for that my Mini simply wouldn’t have been up to the task. We used it to pick up random stuff from Craigslist buys, including a weed whacker and a rototiller. We hauled the brush and branches from 4 trees that we cut down over to the local recycling center. We rented a stump grinder, a vibrating compactor, an auger, a concrete mixer, a tiller, and a concrete saw and brought them from Home Depot to our house and back - many of them more than once. We helped a friend move - from her old 3rd story apartment to her new 3rd story apartment. And we’re talking couches, dressers, and dining room tables, here. We made dozens of treks to home improvement stores for lumber, moulding, concrete, and other supplies. We made countless trips to the recycling center for brush and grass clippings, and I made 11 trips to the leaf drop-off point this fall, each time carrying 8 garbage cans full of leaves. Our dog liked it, too. And it also made for a serviceable extra vehicle. When my Mini was out of commission with a bad water pump, I made the 50-mile round trip commute every day for 2 weeks in the Ranger. The few times the truck wasn’t roadworthy, like when it was at the mechanic, I actually found myself a little anxious without the safety net of a 3rd vehicle. Fall 2016: It’s a dark, rainy, slippery night and I’m heading out of town at the end of a workday. As I approach the green light of an intersection, a GMC Terrain travelling opposite me cuts a sharp left across my lane of traffic. Hard on the brakes, I feel the ancient ABS jockeying the pedal under my foot. Even though I’m barely travelling 25 mph, time does that weird slowy-downy thing and I distinctly think, “Well, I’m gonna hit her.” In a surprisingly tame impact I end up bouncing off her rear passenger door and wheel-well. I pull into a gas station on the corner and check to make sure she’s OK. An officer comes and checks everything out, makes some notes and gets all our information, and with his dismissal, I drive the Ranger 25 miles home as if it never happened. Despite being perfectly driveable, the accident heralded the end of my ownership with the truck. A smashed headlight, misaligned hood, dinged bumper and crushed fender and grille meant that the insurance company declared it a total loss. However, because the accident wasn’t my fault, and the other driver’s insurance was writing the loss, they weren’t allowed to take the truck. So they sent me a check for book value and I got to keep the “wreck” with a clean title... I have no idea how that worked out but I accepted it and decided to stick to my original plan. It was time to let the Ranger find another home. But not before getting a little more work out of it first. In between the crash and getting the check, all the trees in the yard agreed to drop their leaves at the same time. The 11 trips to the leaf-drop off I mentioned before? All with a busted headlight, all with the truck running as well as it ever had. Finally I listed it on Craigslist for a bargain basement price of $1000, with a couple lousy pictures from when I bought it, plus one with the recent damage. I was as honest about its history and the recent accident as I could be. Within 24 hours I had 22 responses. 22. It seems even a ratty truck for a decent price on Craigslist has a shockingly short shelf life. A few were obvious scams and one or two were extreme lowball offers, but one guy lived a few towns over, seemed genuine and fair, and we set up a time to meet. I drove it over to him, we settled on $750, we signed the title and that was that. See that pile of wood out by the curb? I betcha I can take that somewhere. In the weeks since, I’ve started calling this experience the “anti-flip.” Over the summer I successfully flipped my first car; it’s a good read if I haven’t bored you out of your mind yet. In that, basically the goal was to buy low, spend some money to fix it right, and get rid of it as soon as I could to make a profit quick. But with the Ranger, which was definitely not something I was trying to flip, I ended up doing the exact opposite. I bought for pretty much market value, fixed only what I absolutely had to to keep it running, and kept it for as long as I could. And, after the insurance check cleared and the cash from the sale hit the bank account — I broke even. I owned that truck for 2-1/2 years and all I paid for was gas and insurance. So why am I even writing this article? The last dozen paragraphs or so basically describe what a couple million guys in America do with their trucks every day; it’s not exactly a unique situation. As with my last article about the Mazda, I think I’m really using this as a way to sort out my feelings about how the truck affected me. I’m impressed that it did so much and asked for so little. I’m appreciative that it kept me safe in a crash - even a light one. And I’m really lucky that, a few months later, I can happily say that the Ranger’s spot in the driveway has a new inhabitant. If this one is as drama-free as the last one, I’ll eat my hat.